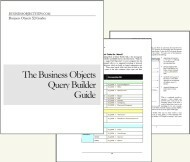 If you are a veteran of Business Objects then you probably have heard of a PAR document. If you are a stickler for details then you may know that PAR stands for “Product Availability Report”. But the rest of us are scratching our heads now, and maybe you guys are too, when we ask ask ourselves “What is a Business Objects PAR document exactly?”. PAR = Supported Platforms ? I really am not sure if PAR is the deprecated Business Objects term for the documents that SAP now wants to call “Supported Platforms”. If this is true, “Amen”, I love the name change, PAR never meant anything to me. It is a strange acronym representing three words that really don’t precisely mean anything as clear as “Supported Platforms”. The SAP Support Portal puts these two document names in the same heading and they call it “Supported Platforms/PARs”. Other than that I am not sure we have anything else backing up the claim that “PAR = Support Platforms”. PAR != Supported Platforms ? The most recent Supported Platforms document at the time this article was written was “Business Objects Enterprise XI 3.1 SP2 for ???? – Supported Platforms”. The Linux one says on page 8 “Unless otherwise specified in the PAR”, so if we are taking this literally we are to understand that there is some other document still called a PAR that is not the Supported Platforms document. Or perhaps this was a mistake; it would not be the first time. I have read on the BOB forum in at least one posting (link) that some of their resident experts (a.k.a. Forum Fanatics) confirm that “PAR” and “Support Platforms” are synonymous. However, the documents themselves seem to confound this belief. I still ask myself, what exactly is a PAR document in 2010 and where can I get one? Thank you for the clarification. I was similarly confounded but am comfortable now that they are funcitonally the same! Your blogs are really very knowledgable. PAR stands for product availability report. This is indeed equivalent to Supported Platform Guide. Now, SAP BO users can check for these from http://service.sap.com/pam or from ‘Articles’ under http://www.sdn.sap.com. Thank you link2boe for adding to the knowledge here. I’m glad you like the site. Is there a way in BO to control the query which is sent through reports to the backend database ? Or is it purely to do with the backend DB management ? Hi Sunehri, thanks for the compliment and the good question. Anything you can send to the database via a SQL statement is permissible. Therefore, for example, for Oracle databases you can put index hints in the SELECT clause of a SQL statement. These work. I can’t think of any other example though. Thanks Julian. I have a scenario here. I have run a report from infoview which inturn has triggered a script at the backend. Now I realise, my report is not optimised. It either runs for a long time or fetches a huge amount of data, so I have stopped the report. But the query would still continue at the backend. Query can be killed if am a root user, from the backend. Is there a way to handle this from BO ? We are using BO Xi3. This behaviour is the same with oracle,netezza databases. Hi Sunehri, holidays are slowing my responses, my apologies. I feel your pain and wish that BO could issue a session kill, but it doesn’t seem to be able to do it. I wonder if a universe limit/control of 10 minutes can stop a runaway query though. What are your limits set to on your universe for duration and row count? If these settings don’t stop it then you will have to depend on the DBA to help you. Killing sessions is not something built into the Business Objects query engine as they tried to keep it as DB independent as possible. « What Are the Differences Between Breaks and Sections?